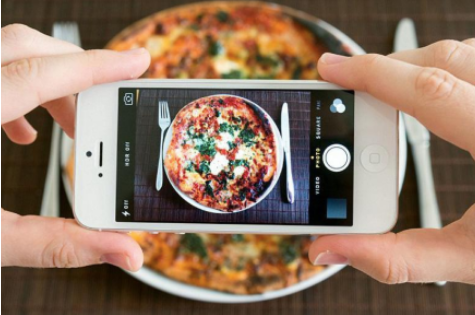 Home > Food > How Important Is Food Imagery For Restaurant Businesses? The effects of images on your food business. To find out whether or not you should be picking up the camera and snapping away at your hors-d'oeuvres, keep reading. When designing a website for your restaurant business, you need to decide what you will communicate and what you will showcase - and how much of it. This ultimately comes down to your brand’s identity and character. For example, if your restaurant’s style is chic and upmarket, you may find it unnecessary and off-brand to display images of food on your homepage. Instead, you may rely on your brand’s reputation and prestige to attract customers. Additionally, if your restaurant’s USP is its interior/exterior or a rooftop terrace, for example, these should be the focus of your images, not food. However, if you have a burger takeaway restaurant, you may need to rely on images to secure orders. Images may be crucial if your restaurant is in a food niche that has a lot of competition (such as burgers), as images are a way to showcase special recipe creations to stand out against your competitors. What’s more, if your burger restaurant is known for its impressive recipes and aesthetics, images would be expected. The danger of relying on images is that they must be top quality and good looking, or you risk putting customers off entirely. Photographing food is not easy, so if your restaurant requires it you should consider enlisting the help of a professional food photographer. Another thing to consider is that the more images you have on your page the slower your site speed may become. There are ways around this, though, such as embedding your social media feed into your site (but we’ll come to that later). Typically, menus do not feature food imagery; whatever the style of the restaurant and the style of the menu, the descriptions tend to do the selling, not pictures. This tactic may work well because it increases the overall intrigue of the menu, and so when the dishes arrive on the table they have that “wow” factor, and the customer is pleasantly surprised. This, of course, is case-by-case - if you feel like your descriptions would sell better if they were accompanied by images, then go for it. Or, maybe select a couple of your most impressive dishes and include pictures of them. The key is to not divert from the overall feel of your brand. If your restaurant interiors are clean, white and crisp, design your menu along the same lines. If your restaurant is a gastro-style pub that is warm and homely, reflect its feel in your menu. Not enough restaurants are using social media to its full potential, and are therefore missing a huge trick. Restaurant patrons are turning to social media platforms more and more to gauge the look and feel of a restaurant and to get a glimpse of dishes. In fact, people will more likely check a restaurant’s Facebook or Instagram page than check their menu before they decide to visit. The main channels to focus on our Facebook, Instagram, Twitter and Pinterest. The key to creating a successful social media channel for your website is to outline your goal (what are you going to post), have a watertight marketing strategy (when are you going to post) and to be consistent. These tactics will differ from restaurant to restaurant, but ultimately you should make your food or restaurant look as good as possible, which means the high-quality camera, good lighting and immaculate presentation. Some foods may be easier to photograph than others (i.e. acai bowls always look good in the sunshine), but if you are struggling to capture your dish at a good angle, put the focus on the surroundings. For example, a bowl of fries isn’t too inspirational on its own, but when put next to a glass of bubbly and with the beach visible in the background, you’re onto a winner. The power of social media means that your restaurant will get more exposure and generate more interest from both existing and prospective customers. When used correctly, it can also increase engagement with your customers. You can even run competitions and offers on social media to get people excited. Another key thing that social media can do is provide proof. Although people are used to not having food imagery on menus, they will go to social media if they want to see what a plate of food looks like. Often this is as a deciding factor between whether they dine at that restaurant or not, but other times people like to see whether your food is “Instagrammable”, and whether they can get a good shot of it, too. Through social media, you can also inject a human element into your marketing. By leverage brand ambassadors to help promote your restaurant, or posting photos of customers enjoying their food, or even BTS shots of your chefs in the kitchen, you can amp up your reputation and get more people interested. Be sure to embed your social media feeds into your website to keep a coherent link between all your channels and boost your online presence. When it comes to using images of your food to attract customers, it really comes down to your brand identity and personal taste. While images of your food are not necessary on your website or your menu, you will always feel the benefit of harnessing photos on social media to create a buzz around your restaurant. New study shows significant positive benefit from the 'Mediterranean diet'.